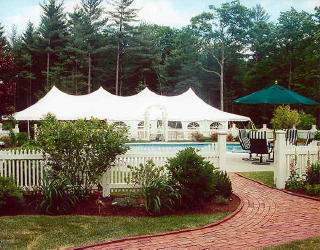 Our Elite tents are recommended when a more formal look is desired. Our clients usually choose these types of tents for events like weddings, christenings or anniversaries. This size tent will fit up to 220 people around tables. It is a rope & pole tent which means it must be installed on level grass. (Required space: 40″x85″). It has four 18″ center poles. Its sides are 7″ and not adjustable. It is compatible with our tent sides. "I was on a tight budget and Clarkstown Party Rentals worked with me to have the wedding I always wanted!"